We each have our own recollections of past events,our personal memories of family members, and these are the building blocks for creating and recording our own stories to preserve in our family histories. I would like to share some tips and tricks for a successful and memorable interview with family members, and how to gather those special family stories that make each of our individual histories so unique. Family stories help to round out the dates and facts in a family genealogy. A good genealogist will be able to tell you the birth, marriage and death dates for a given ancestor, but a wonderful way to enrich those necessary facts is a family story. The story may be an account of a family event such as a special anniversary or occasion or may just be a simple recollection of the family member’s childhood, or their days at school. Ask about their teachers, and ask them to recall the names of their classmates. Family members who served in the military may have some fascinating stories to share of their days in service and historical events that they may have witnessed. These are the stories that enhance and personalize our genealogical dates and documents. Do you have a family member who served in the war? Ask them to tell you some of their stories and the places that they may have travelled to. What do they recall about the war years? The holiday season is just around the corner and it will be a time when extended families get together to celebrate Christmas and the New Year. Let these occasions be your opportunity to record some of your family stories by conducting interviews with your relatives. • Who are your oldest family members? • Will it be formal or informal? • One on one, or a group? • What local, national or world events happened during their lifetimes? • Are there times during the day when older relatives are more alert? In closing – a little organization before and during the interview will help to ensure a successful and enjoyable time for both yourself and your relative. Remember – What the next generation will value most is not what we owned, but the stories of who we were and the tales of how we lived! Write your stories and pass them on! 1896 photo: from the family collection. 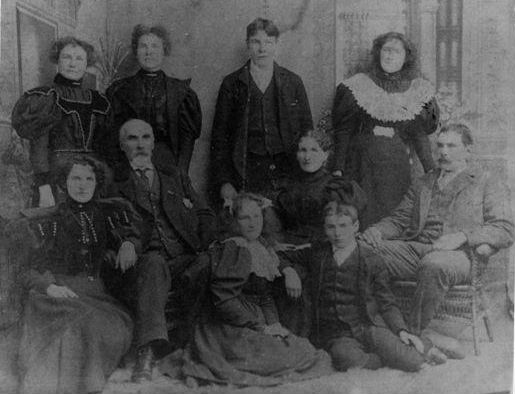 My grandfather – Michael ‘Vincent’ Stafford seated on the floor, and my Great-grandfather Thomas Stafford with the white beard, seated across from my Great-grandmother Mary (Carroll) Stafford. Thomas was the youngest son of pioneer settler Tobias Stafford who came from Kilanerin, County Wexford, Ireland and settled on the 11th concession of Drummond Township in 1816. Mary Carroll’s father Patrick Carroll came from County Limerick, Ireland and was killed by a falling tree at age 34. He is buried in Mt. St. Patrick cemetery, Renfrew County. photo of Corporal Audry (Rutherford) Stafford, taken in 1943, near her parents’ home in Edmonton, Alberta. This entry was posted in Genealogy - Tips, Help & Links and tagged Arlene Stafford-Wilson, family history drummond township, family history lanark county, family history perth ontario, Lanark County family history, Lanark County genealogy, recording family stories, writing family history. Yes! Great article. I would add “Stop Procrastinating.” Save those stories! Laura – I couldn’t have said it better myself! So often we have the stories, or we have the opportunities to interview our relatives and we keep putting it off until it’s too late, and unfortunately sometimes we never get another chance. Good point! Great article. Many of the points are those that I make with my Genealogy 101 students. One point that I add is that if you are making a reliable recording of the interview, do not take notes. Taking notes takes up valuable time and can be a real put off. Be a good listener and let the stories flow. You make an excellent point – that taking notes can slow things down a bit. Sometimes I find that not everyone is comfortable with their voice being recorded and in those cases I have taken notes instead; although not as efficient as a recording for sure! Thanks for the insightful comment!